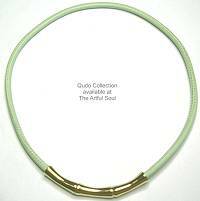 Qudo Collection is made by German company Lizas. Smooth Italian nappa leather from lamb and calf are comfortable around neck and wrist, stitched and dyed for style, with strong yet easy-to-use magnetic clasps incorporated into the design. 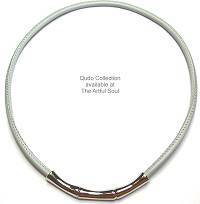 Elegant stainless steel is finished in gold, rosegold, or silver. Sparkles come from extraordinarily large crystals. 8mm square crystal rises from steel cup setting about 5/16 inches, to make a bold statement in its simplicity. Post located about 1/16 inch below top edge. The steel is finished in shiny rose gold, the crystal is opaque jet black. 8mm square crystal rises from steel cup setting about 5/16 inches, to make a bold statement in its simplicity. Post located about 1/16 inch below top edge. 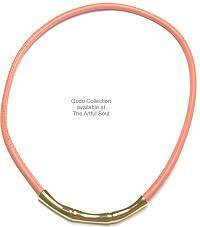 The steel is finished in shiny rose gold, the crystal is transparent peachy pink. 18 inches long featuring the 6-1/2 inch tube that curves in front, 3/8 inch thick. A pair of wrapped and sewn nappa leather cords are threaded through it freely, joining to magnetic clasp in back with strong oval bead shape. The steel metal is finished in shiny yellow gold. The leather is dyed turquoise. 8mm square crystal rises from steel cup setting about 5/16 inches, to make a bold statement in its simplicity. Post located about 1/16 inch below top edge. The steel is finished in silver, the crystal is opalescent misty gray. 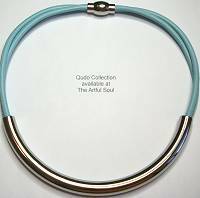 16.5 inches long, a single cord of leather wrapped and stitched, 4mm wide, is joined to a bamboo style magnetic clasp which can be featured at the front of necklace. Clasp is steel, 2-1/2 inches long, it separates between one of the bamboo joints. The steel metal is finished in shiny silver. The leather is dyed light misty gray. 18 inches long featuring the 6-1/2 inch tube that curves in front, 3/8 inch thick. 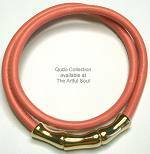 A pair of wrapped and sewn nappa leather cords are threaded through it freely, joining to magnetic clasp in back with strong oval bead shape. The steel metal is finished in shiny silver. The leather is dyed sky blue. Earrings are 3/4 inch long including the one-piece leverback setting. Large crystal stone is 8mm across, 10mm deep in the setting to make a dramatic statement despite its simplicity. The steel is finished in shiny silver, the crystal is clear sky blue. 8mm square crystal rises from steel cup setting about 5/16 inches, to make a bold statement in its simplicity. Post located about 1/16 inch below top edge. The steel is finished in shiny yellow gold, the crystal is opalescent milky sky blue. 8mm square crystal rises from steel cup setting about 5/16 inches, to make a bold statement in its simplicity. Post located about 1/16 inch below top edge. The steel is finished in shiny silver, the crystal is transparent lavender. 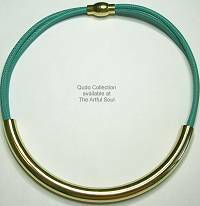 Read about what others think of Qudo Collection jewelry! Instead of reviews for a specific product, this is a place to share about the designer line in general.